NOTE: There is a lot of bad information on the internet regarding the greenhouse effect, which has led to much confusion. The following simple summary was written by a climate scientist (Dr. Roy W. Spencer) who has extensively written and lectured on the subject. There are two common meanings of the term "greenhouse effect". There is a "natural" greenhouse effect that keeps the Earth's climate warm and habitable. There is also the "man-made" greenhouse effect, which is the enhancement of Earth's natural greenhouse effect by the addition of greenhouse gases from the burning of fossil fuels (mainly petroleum, coal, and natural gas). 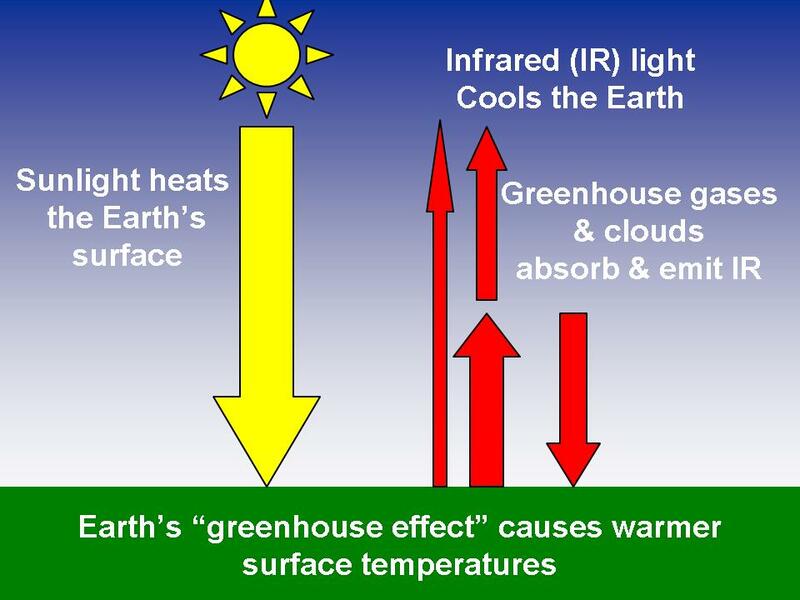 In order to understand how the greenhouse effect operates, we need to first understand "infrared radiation". Greenhouse gases reduce the rate at which the Earth's surface loses infrared radiation to outer space. Because one way to increase the temperature of anything is to reduce its rate of energy loss to its surroundings, this makes the Earth's surface and lower atmosphere warmer than they would otherwise be. You can think of greenhouse gases as sort of a "blanket" for infrared radiation -- they keep the Earth's surface and lower layers of the atmosphere warmer, and the upper layers colder, than if the greenhouse gases were not there. About 80-90% of the Earth's natural greenhouse effect is due to water vapor and clouds. Most of the rest is due to carbon dioxide, methane, and a few other minor gases. While the remaining gases in the atmosphere (e.g. nitrogen, oxygen) also absorb and emit a small amount of infrared radiation, their radiative effect on temperature is so weak that they can be neglected. While methane is a much more potent greenhouse gas than carbon dioxide, there is far less of it in the atmosphere. It is the carbon dioxide concentration that is increasing, due to the burning of fossil fuels (as well as from some rainforest burning). Compared to a pre-industrial atmospheric concentration of around 270 parts per million (ppm), the average concentration has increased to close to 400 ppm in 2012. This causes the man-made portion of the greenhouse effect, and it is believed by many scientists to be responsible for the global warming of the last 50 years or more. Also, the concentration of methane, although extremely small (measured in parts per billion), has also increased in recent decades contributing somewhat to the strengthening of the greenhouse effect. The reasons for this increase, though, remain uncertain. 1) The greenhouse effect does not operate like a greenhouse that plants are grown in. Plant greenhouses stay warm because they are enclosed, preventing warm air from escaping. In the open atmosphere, warm air that builds up at the surface rises ("convects") and mixes with air from higher altitudes, limiting warming near the surface. The atmospheric greenhouse effect is radiative, not convective. 2) The greenhouse effect does not require solar radiation (sunlight) to operate. The greenhouse effect would still exist if there was no sun, and the climate system was instead warmed from below by geothermal energy. 3) The greenhouse effect cannot be demonstrated with a jar or other enclosure because there is too little greenhouse gas involved. Thousands of feet of atmospheric depth are required for the greenhouse effect to have a measurable effect on temperature. The greenhouse effect is entirely due to the fact that the atmosphere absorbs and emits infrared energy, combined with a heat source to warm the bottom of the atmosphere (in our case, the Sun) and the cold depths of outer space above the top of the atmosphere. The greenhouse gases (and clouds) reduce the ability of the Earth's surface to cool, thus raising its temperature above what it would be without those greenhouse gases. A backyard greenhouse effect experiment that works. Why the "greenhouse effect in a jar" experiment cannot work. DOES THE GREENHOUSE EFFECT EVEN EXIST? Greenhouse warming of the Earth's surface is believed by some people to be physically impossible. They claim it would violate the 2nd Law of Thermodynamics, which basically states that energy must flow from higher temperatures to lower temperatures. The reason for this apparent violation is that the existence of greenhouse gases in the middle and upper COLDER layers of the atmosphere make the surface WARMER, which would suggest energy flow from colder to warmer temperatures, which would seem to violate the 2nd Law. But the greenhouse effect is kind of like adding a lid to cover a pot of water on the stove...even though the lid is colder than the water, its presence actually makes the water warmer. The flow of IR radiation between two objects is always two-way, with the total net flow being from warmer to colder temperatures. So, the 2nd Law is not really violated because it's the net flow of energy which must be from warmer to colder temperatures, which is indeed the case in both the greenhouse effect, and adding a lid to the pot of water on the stove.